Looking for a good introduction to Hokusai? There are of course lots of books about this great artist. Some are weighty, oversized tomes that I suspect are more impressive-looking (and impressive) than they are read. Five hundred page volumes complete with scholarly text are not the optimal place to start learning about the genius who conceived "Under the Wave off Kanagawa" - the world's most famous print. That's why I prefer Ms. Thompson's book. It's the best introduction I've read for those who want to learn or know more about Katsushika Hokusai (or one of the other 30 names he chose to call himself over a 70+ year artistic career). There's lots of information here about Hokusai's life and art, along with background on the Edo period in which he lived. The writing is fine and strikes the right balance between simple and abstruse. The book's 162 pages cannot be any more comprehensive than an introduction to some other subject. Nevertheless the text along with wonderfully photographed illustrations and illuminating closeup cutaways hit all the highlights of Hokusai's art which you'll need to get started. In sum, Hokusai is an excellent foundation for further reading and museum exhibition viewing. Whether this book is what you're looking for depends on your objective. Sarah E. Thompson's Hokusai, reviewed in this group of Hokusai books, is an excellent choice for a relatively short introduction to the great artist. But if you want a comprehensive alternative, I suggest this one. Timothy Clark has put together an extensive cross-section of prints, paintings and sketches from the broad range of Hokusai's work. The great 1830s landscape series upon which his fame rests are well represented here. They include the 36 Views of Mount Fuji, the Famous Bridges, and the Tour of Waterfalls. The Large Flowers and Small Flowers series are also here, less known than the landscapes but no less wonderful. And works of Hokusai's daughter Oei (alternately "Oi") are represented as well, possibly due to the splash heard round the Hokusai world from Katherine Govier's novel, The Printmaker's Daughter (also reviewed in this section). Something else worth knowing - this book was published by the Trustees of the British Museum as a companion piece to the 2017 Hokusai exhibition presented in Britain and Japan that year. Included are essays by five Hokusai scholars, among them editor Timothy Clark. Anyone who takes the time to read these essays carefully and study the photographed catalog art should come away with a superb understanding of the artist and his art. Hokusai's 36 Views of Mt. Fuji was published over the five year period 1830-34 and was the first major, financially successful Japanese landscape print series in the history of ukiyo-e. While there certainly were landscape-focused prints and series in the decades before this one, none are familiar today except to scholars. The 36 Views was so successful out the gate that the publisher ultimately decided to add 10 designs. So the title says 36 but in fact the complete set includes 46 designs. Jocelyn Bouquillard is curator at the French National Library in the photography and prints department, and he specializes in Japanese landscape prints. His book is a nice, compact way to own a complete photo set of these prints. Each is accompanied by brief explanatory text, and some photos are blown up for viewing detail. Typical art book glossy paper stock is not used here but that helps keeps the price reasonably low. Of critical importance to any volume on this subject is the quality of prints selected for the plates. Here, three 36 Views collections owned by the French National Library comprise the original source material. The earliest of the collections was donated to the Library in 1888. Judging by the richness of color and generally fine condition of the prints given their age, this is a book worth owning. I've seen some criticism online, which I think is misinformed. Most original or early edition 19th century prints have issues of one kind or another. At the time, knowledge of how to care for works of art on paper was nothing like it is today. So some prints reproduced in this book have issues, but they are not of the kind that would deter a serious, knowledgeable collector. Fold lines down the center or occasional smudges pale in comparison to the quality of original carving and printing which are still discernible. Mt. Fuji embodies profound spirituality under the ancient Shinto belief that everything has a divine essence. This applies not only to people, but to ancestors - along with animals, inanimate objects, and everything natural - including trees, thunderstorms, and mountains. As the largest mountain in Japan, Fuji carries a particularly deep spiritual significance, easily attracting a devout being like Hokusai. Hokusai's 36 Views are sometimes compared to Monet's Haystacks (and the Rouen Cathedral canvases). Working 60 years after Hokusai began the 36 Views, Monet produced 25 paintings which explore haystacks at different times of day in different light, from different angles, and in different weather - exactly what Hokusai does in his series. Is there a connection? We know the Impressionists were in awe of Japanese prints. We also know that Monet had a sizable collection, with a substantial helping of Hokusai. Some of Monet's most admired work was directly inspired by Japonisme, the love affair with Japanese art and culture which took Europe and America by storm in the later 19th century. Note: Parts of this review are taken from my 2-part article, Hokusai and Mt. Fuji. You can see the entire article here. This is a novel with a mission. Ms. Govier came to Hokusai from outside academia and did enough research to take a baseball bat to conventional Hokusai wisdom. Her Hokusai is not the antiseptic genius described in reverential coffee table books. In one way of putting it, she asks if it's possible some of the Hokusai prints or paintings you lovingly acquired for your collection or for your gallery aren't really Hokusai's at all, but the unacknowledged work of his daughter Oei. There isn't a whole lot of corroborated information about Hokusai's life, and there's far, far less about Oei. Much more is known about Edo and other locales in the story. So readers wishing to separate undisputed fact from fiction - and this is a novel - may want to do some further reading on these subjects. Ms. Govier takes us from Oei's childhood right to her last day on earth. I won't reveal the unexpected manner of death which the author has imagined for her. I will say that much though not all of Oei's life as told here is linked to Hokusai's daily existence, which we experience by way of Oei's first person telling. But the focus is always on Oei and her view of things. If it were otherwise "Hokusai's Daughter" might have been the title, which surely would have goosed sales but at the cost of compromising Ms. Govier's intent. 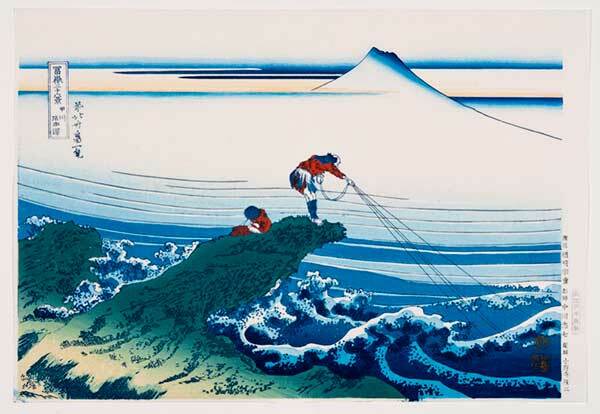 Katsushika Hokusai is probably the world's most revered Japanese artist. But if the author has her way that reverence will need to be shared between Hokusai and Oei, an impressive artist in her own right. (Perhaps equally impressive in the author's view.) Ms. Govier's case is strongest when her Afterword argues the difficulties an aged, "palsied" Hokusai would have had doing the fine paintings attributed to his last years. In her view, aspects of Oei's known style curiously appear in those paintings along with some earlier pieces attributed to her father. These purported mis-attributions are the driving force behind her novel. The author is an artist herself, with words her brush. Example: "Like the glass prisms in Western books they [faraway mountains] shattered the light, becoming transparent against the bright slabs of sky." Gems like this pop up periodically, and add immeasurably to the novel. This story may entice anyone interested in a Dickensian view of 19th century Edo, which is likely the most accurate way to see that era. For many - particularly courtesans at the Yoshiwara brothels - everyday life in Edo seldom was pleasant. Ms. Govier may well have had Dickens in mind when building her characters and describing their environs. The Printmaker's Daughter delivers a serious message - along with a research opportunity for doctoral students seeking a dissertation topic. If Katsushika Oei's genius finally emerges from well over a century of neglect, we can thank Katherine Govier for giving the effort one heck of a shove. Hokusai produced two great Fuji print series in the 1830s: the 36 Views of Mt. Fuji, and the 100 Views of Mt. Fuji. His main claim to fame is the 36 Views, which includes the world-renowned "Under the Wave off Kanagawa" (aka "The Great Wave"). None of the 100 Views ever achieved comparable fame but that hasn't deterred critics from proclaiming this series Hokusai's lifetime masterpiece. Unusual for ukiyo-e, these prints were published in book form rather than as separate and apart from each other. The first of three volumes quickly followed Hokusai's blockbuster 36 Views, and was published in 1834. The final volume appeared sometime in the late 1840s. The first thing you notice flipping through these sketches is that unlike the 36 Views, they aren't in color. Hokusai was limited here to sumi (black) ink, gray (achieved by diluting sumi), and white. But within those limitations he produced one of the great classics of his age. Why the absence of color? The complete 102 designs (two "extras" thrown in) if printed in color would have been ruinous for Hokusai's publisher. Japan in the mid-1830s was wracked by famine, with dire economic consequences. It would be another 25 years before the market accepted a 100-print color series, and that was Hiroshige's 100 Famous Views of Edo, published in 1859 (and reviewed under "Books-Art-Hiroshige" in these book reviews). The 36 Views outdoes its successor series for accuracy portraying actual scenery in Fuji's vicinity. But literal accuracy wasn't a major concern for Hokusai - just as it was not for the Impressionists who admired him. So what we get instead is a display of his enormous imaginative range. Who would have thought it's possible to portray a mountain in so many ways without repeating yourself or dropping artistic or creative standards? Yet Hokusai maintains a very high level of integrity throughout. Sometimes Mt. Fuji is the clear focus of attention, sometimes it's people going about their business, or wonderful animals doing their thing. Still other times the mountain is a distant backdrop subsumed in foreground landscape. Pick a half dozen prints at random to see why the 100 Views easily establishes Hokusai's genius for draftsmanship. Since we're not distracted by color, this element takes on fundamental importance. It's also the reason many who write about Hokusai consider this series his greatest achievement. Smith's book includes all three volumes which comprise the series. In his Introduction he advises that the 100 Views "achieves true masterpiece status only in the original edition, which is reproduced here" (from a copy housed at the New York Public Library). Apparently later editions suffered from over-production, resulting in worn blocks. Collectors of older best selling prints frequently encounter this problem. Publishers often weren't above squeezing every mon possible (every cent) from an original block - to the point where the designer's genius was reduced to the commonplace. So I recommend this book without hesitation. And don't skip the Introduction, which is well worth reading in its entirety for anyone interested in a deeper understanding of the 100 Views.